I've written in a number of places about how GitHub can be a great place to store data. Unlike basically all other web data storage sites (many of which I really like such as Dataverse and FigShare) GitHub enables deep social data set development and fits nicely into a reproducible research workflow with R.
One negative though, especially compared to FigShare, was that there was no easy way to view CSV or TSV data files in the browser. Unless you downloaded the data and opened it in Excel or an R viewer or whatever, you had to look at the raw data file in the browser. It's basically impossible to make sense of a data set of any size like this. 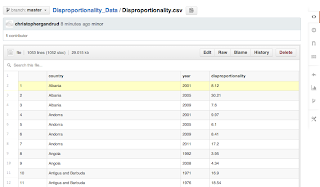 However, from at least today, GitHub now renders the data set in the browser as you would expect. Take a look at their blog post for the details.